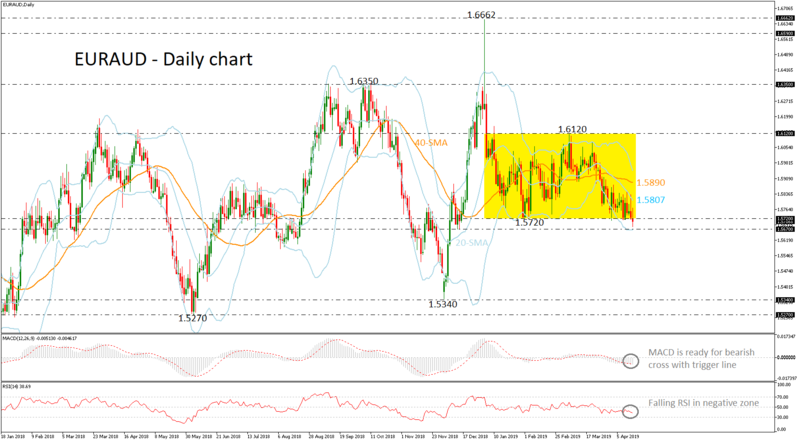 EURAUD is diving beneath the short-term narrow range today, sending prices towards the lower Bollinger band and reaching a fresh four-month low of 1.5681. The pair found a strong resistance obstacle on the mid-level of the Bollinger band (20-SMA), while the technical indicators are endorsing the bearish view. The MACD oscillator is ready to post a negative cross with its trigger line and the RSI is declining below the neutral threshold of 50. Further weak momentum in the pair, below 1.5670 could extend the downside move until the December 2018 low of 1.5340 as there are no significant barriers before that level. On the other hand, an upside rally could meet resistance around the 20-day simple moving average (SMA) currently at 1.5807 before touching the 40-day SMA at 1.5890. Slightly above these lines, the upper Bollinger band is coming into focus around 1.5950, while even higher, the 1.6120 could attract greater attention. Summarizing, the bias remains neutral to bearish and investors should wait for a daily close beneath 1.5670 for possible selling orders.